Art experts yesterday reacted with concern at the prospect of masterpieces from the Detroit Museum of Art including works by Bellini, Rembrandt, Van Gogh and Picasso, suddenly flooding the global market. That possibility looms in the wake of the biggest U.S. municipal bankruptcy filing by the city on July 18. The Detroit collection has been valued at more than $1 billion. 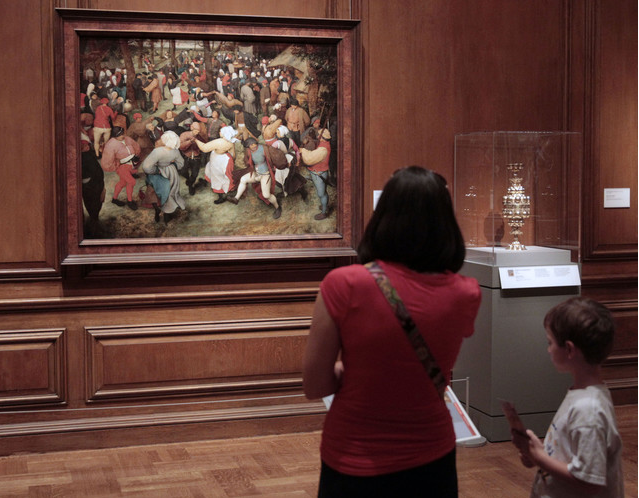 A visitor in front of Breughel’s The Wedding Dance at the Detroit Museum. As ravenous as collectors and new museums are, there are limits, even in the Persian Gulf. “They can’t put 100 masterpieces on the market at the same time,” said Todd Levin, a Detroit-born, New York-based director with Levin Art Group. “You will depress the market.” Detroit’s struggling managers may not share that concern. The city should be able to use assets, including artwork in the 128-year-old museum, to repay obligations, said Jon Schotz, co-managing partner at Kayne Saybrook Municipal Opportunity Funds, which has more than $300 million of distressed municipal-bond debt. Schotz declined to say whether the firm holds Detroit bonds. The city pensions are underfunded by as much as $3.5 billion, Emergency Manager Kevyn Orr said in the filing. “The creditors have said everything is on the table,” said Bruce Babiarz, a spokesman for the Detroit Police and Fire Department. On this table are about 60,000 works, ranging from Egyptian mummies to cutting-edge contemporary art. “The DIA is among the top 10 museums in the United States in terms of the breadth and depth of its permanent collection,” said Maxwell Anderson, director of the Dallas Museum of Art in an interview. Asked about valuations that put the collection in the billions, he said, “It doesn’t seem implausible.” The works include Diego Rivera’s 27-panel fresco “Detroit Industry,” which occupies a garden court and is a tribute to the city’s labor force of the 1930s. Rivera considered it his most successful work. At least three paintings — Van Gogh’s “Portrait of Postman Roulin,” “The Wedding Dance” by Pieter Bruegel the Elder and “Madonna and Child” by Giovanni Bellini — could each fetch more than $150 million. “You are talking about works of such exceptional significance, they would be comparable in value to pieces like Picasso’s ‘Le Reve’ and Cezanne’s ‘Card Players,’” Beverly Schreiber Jacoby, valuation specialist and president of New York-based BSJ Fine Art, told Bloomberg News in May. The case is City of Detroit, 13-bk-53846, US Bankruptcy Court, Eastern District of Michigan (Detroit).